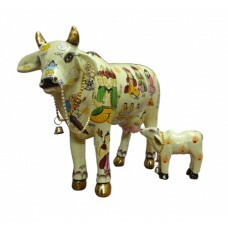 Kamdhenu Cow With calf Deities ( Bothsided God-Goddeses)Dimension : L-10 x W-4.5 &n..
Dimension : L-10 x W-4.5 x H-8.5 Inches Approx. Kamdhenu cow along with its calf is the symbol of prosperity and vatsalya (love that a mother feels for a child) and is considered highly auspicious for countering the vaastudoshas (architectural faults) & enhancing the overall good luck. The name Kamadhenu came from the Sanskrit root, "Kamaduha", which literally means, "the cow of plenty" and "the one through whom all desires are fulfilled".It is believed that each part of the kamdhenu cow embodies a particular deity & is worshipped as the divine wish-fulfilling cow goddess, according to Hindu mythology.